Introduction: The Hospital Consumer Assessment of Healthcare Providers Survey (HCAHPS) is distributed to patients >=30 days from hospital discharge and now contributes to hospital reimbursements. The poor overall response rate (20%) and slow survey response time (>90 days) delays communication between patients and healthcare providers regarding patient satisfaction with hospital care, suggestions for change, and opportunities for healthcare/quality improvement. Our group sought to understand the experience of hospitalized patients in real-time. Methods: We conducted a 3-month pilot study using a novel mobile communication platform capturing patient-generated comments and ratings during their in-patient stay. Responses were electronically communicated to providers via a secured streaming dashboard. Providers were encouraged to use this information to identify and address actionable items, document their actions and obtain patient follow-up. HCAHPS results were collected for the study period over the course of 6 months. Success metrics set forth included a raw 2.0 increase in each corresponding HCAHPS measure, 30% overall patient engagement, and 50% positive provider response to the intervention. Real-time ratings were calculated using net promoter score methodology and paired analysis of time-matched HCAHPS scores focusing on two measures was performed. Qualitative analysis of dashboard comments was also performed, and patients’ healthcare providers were surveyed to identify effective processes and balancing measures. Results: Of 1,828 patients enrolled on 2 medical and 5 surgical units, 485 ( 26.5%) patients provided hospital ratings and feedback for improvement (n=1236 comments). Responses were grouped into several categories, both original and known items found in reimbursement-based satisfaction surveys, including: nursing communication (12.9%), physician communication (9.0%), pain management (14.6%), nutrition (10.6%), environmental/noise (8.9%), and emotional support (3.4%). Overall patient satisfaction received a net promoter score of +56 (scale -100 to +100). 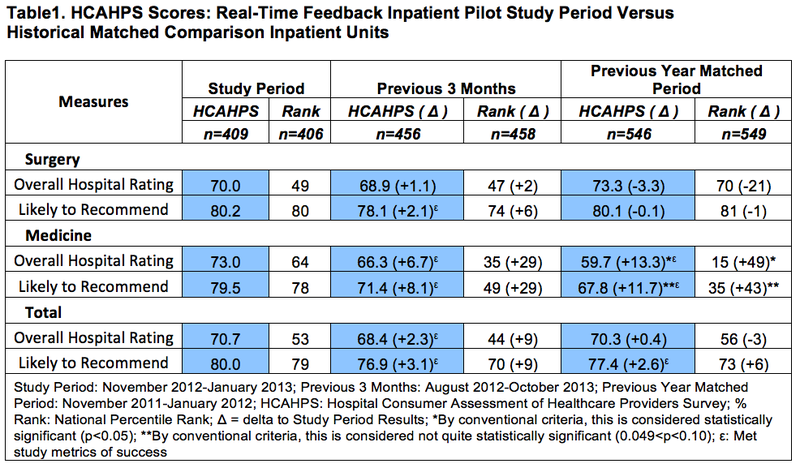 We observed an increase in time-matched HCAHPS scores for all units in our pilot Table1. Provider feedback was extracted weekly and 65% felt that the feedback from patients was useful. Conclusion: Real-time inpatient feedback regarding hospital care is feasible and yields valuable information on factors that are important to in-patients. This also facilitates bidirectional communication between patients and their providers, uncovers immediately actionable issues to improve inpatient satisfaction, and is found useful to patients and providers.